$13.309 million on 2601 screens. Rated PG-13 for a scene of sexuality, and for brief language. According to the experts, after the events of September 11, 2001, flicks like Serendipity should have dominated box offices. It hit screens on October 5, and pundits felt it was exactly the sort of story the nation craved. Light, sweet, gentle and vaguely reassuring, it should have struck a positive chord. But it didn’t. With a gross of $50 million, it didn’t tank, but frankly, that’s chump change in this day and age. Audiences showed escapist tendencies with fare such as Harry Potter and the Sorcerer’s Stone and The Lord of the Rings: The Fellowship of the Ring, but apparently romantic tales didn’t do the trick. Or maybe people just sought films with really long titles - perhaps a traumatized nation sought word-filled marquees as a sign of depth and stability. Whatever the case may be, the film’s relatively flat performance shouldn’t be seen as a negative appraisal of the movie itself. While it never reinvents the romantic-comedy wheel, and it suffers from the occasional surfeit of cuteness, Serendipity offers a reasonably entertaining and engaging little flick, largely thanks to the excellent cast. Serendipity starts an unspecified time period in the past. During the busy Christmas shopping season, Jon (John Cusack) and Sara (Kate Beckinsale) meet at a department store as they both try to purchase the pair of gloves. After some cute bickering, Jon cedes the hand coverings to the lovely Sara if she agrees to get a cup of coffee with him. This she does, and they launch into a terrific semi-date together. Despite the wildly flying chemistry between the two, Sarah believes in fate and resists Jon’s attempts to wheedle additional information out of her. Eventually, she comes to a “compromise”. She has Jon write his name and number on a five-dollar bill, which she then uses to buy some breath mints. Sara pens her own info inside a book that she will then sell to a used bookstore the next day. If one of them eventually finds the other’s number, then it was meant to be; otherwise, que Sara Sara. Flash forward to the present. Sara lives in San Francisco, where she becomes affianced to self-absorbed New Age musician Lars (John Corbett). Back in New York, Jon nears his own marriage to Halley (Bridget Moynahan). However, both Sara and Jon remain vaguely obsessed with their one special evening together, and he decides he has to make one last search for her before the wedding. Coincidentally, she does the same. 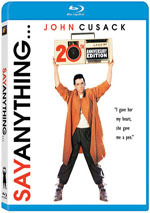 Assisted by their friends - Jon’s buddy Dean (Jeremy Piven) and Sara’s cohort Eve (Molly Shannon) - the two make their independent quests to answer their nagging doubts once and for all. The majority of the film follows these endeavors. No, I won’t reveal how the flick ends, but you probably won’t find it to offer any surprises. Not that I regard this as a negative necessarily; predictable movies can still be good, and Serendipity offers a fairly entertaining experience. If I had to pick the main negative, it would stem from the excessive cuteness of the piece. Admittedly, it could have been much worse; I definitely expected an even heavier level of treacle. Nonetheless, the movie poured on the goop at times, and a cynic like myself could find it hard to take. Some may find fault with the many coincidences that occur, but frankly, they didn’t bother me. Just like you must accept talking animals to enjoy a Disney flick, I could deal with excessive coincidence as part of the bargain. What I couldn’t comprehend, however, was the reason why Sara’d bother with a fool like Lars. Not only does she not seem to love him, but also she barely appears to suppress her contempt for him. Jon and Halley make a believable couple, but not for one second do we see any potential for Sara and Lars. Otherwise, most of my thoughts about Serendipity remain fairly positive. Director Peter Chelsom rebounds from the notable disaster of Town and Country to create a pretty effective romantic comedy, and he milks the tension of the near-encounters nicely. Sure, we know where things will go, but the movie offers a tight little ride nonetheless. Ultimately, the film succeeds due to the actors, as all the main participants form nicely realized and engaging characters. Cusack has emerged as a consistently likable and charming presence, and he does nothing to alter that perception here. Beckinsale seems a bit less compelling, but she still makes Sara lovable, even when I felt annoyed at her insistence on letting fate settle matters. While the leads are good, the supporting cast really helps make the movie go. Piven and Shannon offer terrific turns as the friends; they flesh out their roles to become more than just the standard second bananas. We also find a wonderful bit from SCTV alumnus - and now virtually ubiquitous movie presence - Eugene Levy. He pops up as a persnickety store clerk and steals every scene in which he appears. Levy couldn’t do much to rescue American Pie 2, but here he does wonders. At the end of the day, I can’t claim that Serendipity totally won my affection. It does little to differentiate itself from a slew of other cute romantic comedies. Nonetheless, it seems like a generally amusing and enjoyable piece, and the splendid cast allows it to reach a moderately high level of success. 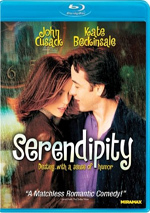 Serendipity won’t win over those who hate the genre, but fans of chick flicks should get a kick out of it. Serendipity appears in an aspect ratio of approximately 1.85:1 on this Blu-ray Disc. This wasn’t a poor presentation, but it had some problems. Probably the main issue stemmed from edge haloes. While these weren’t heavy, they showed up on more than a few occasions and contributed a looseness to the image at times. Overall sharpness was fairly good, though; some softness crept into wider shots, but most of the movie looked reasonably accurate and concise. No issues with edge haloes or shimmering occurred, and the film lacked print flaws; outside of some natural grain, the picture was clean. Colors looked generally natural. The tones could seem a bit heavy at times, but they were usually pretty peppy and full. Black levels also seemed deep and dense, while shadow detail mostly looked clear and appropriately opaque. A few interiors appeared slightly thick, but I didn’t mind for the most part. All in all, the image had good elements but the problems made it a “C+”. While the DTS-HD MA 5.1 soundtrack of Serendipity showed the lack of sonic ambition typical of comedies, it still worked well for the material. The soundfield featured a definite emphasis on the forward channels. Music displayed good stereo imaging, while effects showed positive movement and integration. Mostly those elements stuck with general ambience, though some cars drove from side to side and the general impression offered a realistic affair. Rear speaker usage largely stayed with moderate reinforcement of the music and effects, though a smidgen of split surround material appeared; for example, at the driving range, I heard some stereo audio in the rear. Audio quality seemed fine. Dialogue was distinct and natural, with no edginess or problems related to intelligibility. Effects remained a minor element of the mix, but they always came across as clean and accurate, without distortion or other concerns. Those elements sounded crisp and clear. Music presented the strongest aspects of the track. The score and songs always were nicely bright and vivid, and they displayed good low-end response as well. Bass seemed reasonably deep and tight. Overall, the track’s lack of sonic ambition kept it in “B” territory, but it complemented the film well. How did the Blu-ray compare to the original DVD? Audio was a little peppier, but the two tracks seemed fairly comparable, mainly because the movie was so laid back in terms of sound. Visuals showed some improvements but the Blu-ray’s flaws meant it wasn’t as big a step up as I’d like. The Blu-ray replicates most of the supplements from the DVD. We start with an audio commentary from director Peter Chelsom, who provides a running, screen-specific track. Chelsom seems like a chatty guy, and he offers a reasonably engaging presence here. The director covers a lot of notes about the film, from working with the cast, changes from script to screen, reshoots, location challenges, and a number of other issues. Occasional empty spaces mar the presentation, but these seem acceptably infrequent and minor. Chelsom doesn’t give us a great commentary, but it appears generally entertaining and informative. Next we discover nine deleted scenes. These clips run a total of 15 minutes, 50 seconds, and they can be viewed with or without commentary from Chelsom. For the most part, these offer extensions of existing scenes, or alternate takes; most of the latter come from the original shoot, whereas the final film includes a few examples of reshoots. The snippets are interesting to see, but nothing crucial emerges. As for Chelsom’s commentary, it’s quite good. He covers all the reasons why the scenes failed to make the movie, and he adds some good insight and anecdotes. Chelsom provides frank and worthwhile notes that definitely merit a listen. The Starz Encore “On the Set” program provides a 19-minute and 54-second documentary about Serendipity. It offers the standard mix of behind-the-scenes shots, movie clips and interviews with principals. In the latter domain, we hear from director Chelsom, producers Peter Abrams and Simon Fields, writer Marc Klein, and actors John Cusack, Kate Beckinsale, Jeremy Piven, Molly Shannon, Bridget Moynahan, and John Corbett. Anyone who expects anything other than the standard promotional piece will leave disappointed. Actually, “On the Set” does include a little interesting behind-the-scenes footage, and the best material shows up toward the end, when we see them create winter in July. Otherwise, the interview clips seem dull; we learn that the cast was great, the director was great, and shooting in New York was great. The program also provides far too many movie snippets; they clearly dominate this piece. Skip to around the 16-minute mark, watch the parts about winter, and skip the rest. The Storyboard Comparison shows one brief scene. We see the bit in which Molly Shannon gets hit at the driving range. For the 44-second clip, the storyboard fills the top two-thirds of the screen, while the film occupies a small inset in the lower right corner. It’s not terribly interesting. Peter Chelsom’s On Set Diary provides 20 screens of text. We read his notes from the set and also see a mix of photos. Some of the information repeats what we learn in the commentary, but it still offers a nice little look at the director’s experiences. There’s no “dirt” to be found, but I think it’s fun nonetheless. The disc opens with ads for The Switch, From Prada to Nada, Killers and 40 Days and 40 Nights. These also pop up under Trailers, and we get the theatrical promo for Serendipity as well. Serendipity does nothing to reinvent the romantic comedy, but it offers a reasonably charming and entertaining piece nonetheless. It avoids becoming excessively cutesy and offers some fine performances from a solid cast. The Blu-ray provides erratic visuals along with good audio and a pretty nice set of supplements. It’s too bad the transfer comes with problems, but this is still the best home video version of the film.